Cloud Hosting is the delivery of a computer based service provided by multiple connected computers operating together as one system, offering scalability of computing resources and the reliability of redundant components. Cloud hosting services are typically operated by a specialist cloud hosting provider and accessed either over the Internet or a dedicated network connection; with the connected servers residing in one or more data centres which may be geographically dispersed. Let’s look at this in more details, there are actually two separate definitions that we need to focus on: Hosting and Cloud. Hosting may be familiar to many people and historically was most commonly associated with the “hosting” of a web site. The large majority of businesses have a company website but most don’t use their own servers to publish it, they use a web hosting service. It usually works out cheaper and helps the security of the company’s own IT infrastructure. Hosting isn’t limited to web sites and more often companies are now looking to host more and more (if not all) of their IT with a hosting provider. 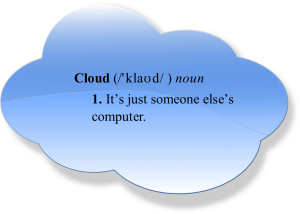 Cloud as a term is a bit more ambiguous and there are various interpretations of how the term was coined. The strict definition of Cloud refers to a service that is provided using a multiple number of connected servers as opposed to a single dedicated standalone server. Another definition commonly heard is Cloud computing is “just someone else’s computer”. So Cloud Hosting of a website for example means that a third party company “hosts” the website on infrastructure supported by multiple connected servers which could be in one location or spread across multiple data centres which could be in different cities or countries. Why is Cloud Hosting Useful? The main advantage of Cloud Hosting is that the service is not limited to the available resources of one physical server; the memory and CPU of several servers can be combined together to cope with whatever load is being put upon the service, be it numbers of visitors to a website or scale and complexity of mathematical queries. This ability of cloud hosting to spread the load also enables built in redundancy, letting other servers take over if a hardware fault affects an underlying physical server. Another reason the term “Cloud” hosting seems so appropriate is that often the people using the service don’t know, and don’t need to know, where that service is, it’s just “up there somewhere”, “in the cloud”. While Cloud Hosting is often trumpeted as the ability to scale up to dozens of servers to cope with extreme load, it is actually used more often to enable multiple smaller services to share the resources of a high specification server. Hundreds of small websites for example could run on one or two servers rather than each individual businesses having to buy or rent a whole server each. Small businesses can benefit from the economies of scale available to a large cloud hosting provider. Cloud hosting enables computing to become more of a “utility” with businesses just paying for what they need in the same way as they would their phone bill. It is often referred to as Pay-As-You-Go computing. Scalability to ensure a high level of performance regardless of the demands put upon the service. Redundancy, no single point of failure. Lower cost to customers, enterprise level functionality and features are shared amongst thousands of users. No significant upfront costs, pay as you go as an operating expenditure. Better reliability, reduced risk of downtime from hardware failures. Contact us here or simply call 01282 500318 to speak with one of our technical sales consultants.